Civitas Romana encompasses our overall Roman Living History experience. At public events we interact with the general public in our Roman camp where we provide displays, explanations and demonstrations. Members may be Roman soldiers, senators, noble matrons, ordinary plebs, barbarians or even slaves, as they wish, and you can play many roles. Our club social events include Roman feasts and festivals, movie-nights, and general club meetings. These are often held at our full-sized Roman Temple complex at Grafton, which you are welcome to visit. We like to share research, news and speculation on all aspects of the Roman Empire and run an active Imperium-Romana facebook page. We have an extensive Roman Library for members' use. Members enjoy working together on a variety of handicrafts to manufacture our own Roman gear, including clothing, weapons and everyday items. In summer we meet fortnightly for Roman military training, gladiator practice, archery, swordplay, craft workshops, and group symposiums. We own an extensive range of Roman equipment and resources. 1. Helping organise and run events, such as assisting to dress the actors, manning the information desk, guarding gear, supervising the stage area, taking photos, and being a general (much-loved) help. 2. Participating as extras in the Gladiator shows. 3. Following our Roman legion in public parades wearing your chosen Roman or barbarian dress. 4. Joining in events in your chosen Roman role (feasts, Saturnalia festival, promotional events, public displays). 5. Giving explanations and demonstrations to the general public in our Roman living history camp. We welcome you as a highly valued and respected member of the group because everything we do is as a team, and the lead actors can't perform without your help and support. We always maintain high standards of safety and ensure that our events are enjoyable fun. Please join us - because we really want you! Married Roman women were called Domina (Lady) and her husband was Dominus (Lord). The ancient Romans honoured their women - Dominae - who ran their households and were responsible for a vast range of duties. 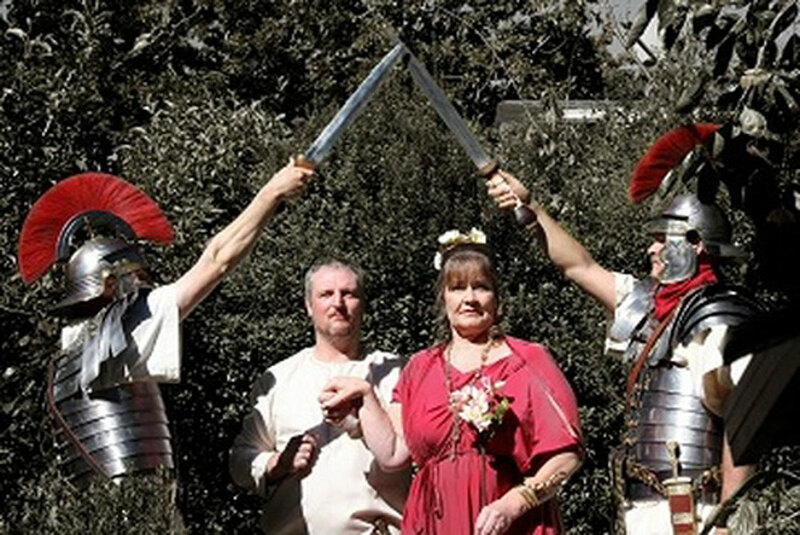 The first official Roman wedding was performed in Auckland NZ 2010 when Lucius married Lisa with a full Roman Honour Guard and matrimonial rites performed in both English and Latin. Following the service was a Roman gladiator fight as an offering of blood for their future health and prosperity. The body-parts of dead gladiators were considered by ancient Romans to be very powerful talismans of good luck, and when the member of the defeated gladiator was served to the bride on a plate it was easy to see from the gales of laughter that this would be a very happy union blessed by all the gods.